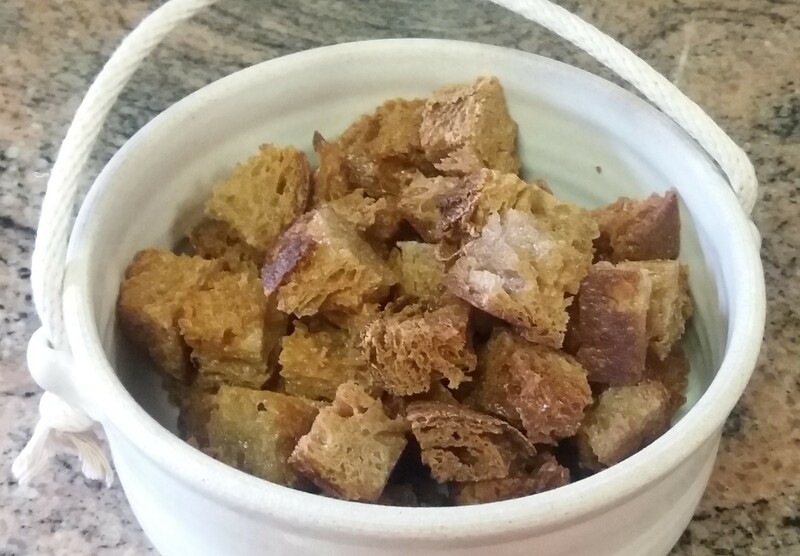 These amazing croutons can be added to almost any soup and it will make your taste buds go YUM! The combination of crunch and oil is amazing. A must especially in the colder winter months. Pour enough oil in a cast iron pot so the bread will have room to float, usually an inch or two deep. While the oil is coming up to temperature, slice the bread into cubes. The oil will be ready for deep-frying when a piece of bread is dropped in and it falls to the bottom and immediately rises. This is usually around 380 degrees. When the oil is ready, drop the croutons into the pot and fry until golden brown. Try not to overcrowd the croutons in the pot. You want a little space between each crouton. When golden brown, scoop out with a vegetable ladle and place on a unbleached paper towel to drain. These will keep for several days but you may find your family won’t let them stay around that long.